Atlas Honda is considered among one of the most popular motorbike manufacturers in Pakistan. The company is a joint venture of Honda Motor Company Japan and Atlas Group of Companies. Honda bikes are known among the consumers in Pakistan for their extravagant build quality and resale value in the motorbike industry. Every year Honda new bike models are launched with appealing graphics and aggressive design. Honda motorcycles have the capability to give its riders a comfortable and luxury drive experience. The main reason behind the popularity of this company is Honda motorcycle price, which is fairly reasonable as compared to other brand motorbikes available in Pakistan. The sale figures of the company are showing healthy sales as its bikes are single-handedly meeting the luxurious bike demands of consumers living in Pakistan. Furthermore, Atlas Honda motorcycle Pakistan has one of the major dealership networks in Pakistan, which is also the reason behind its market dominance in the motorbike industry. 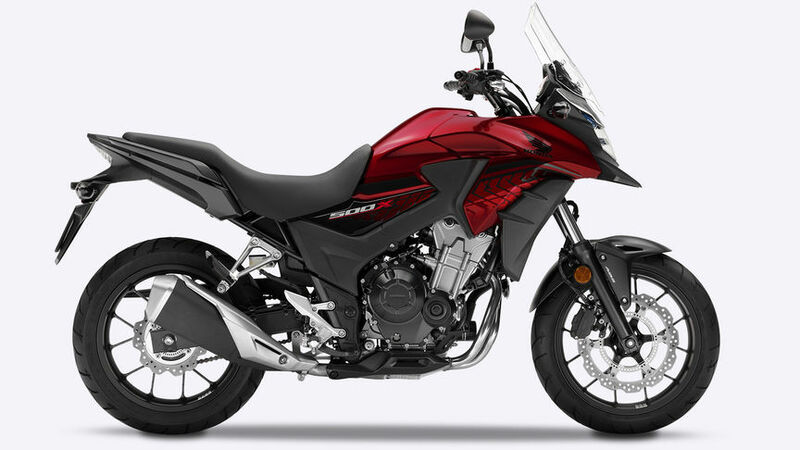 Here in this blog, I will be discussing most popular Honda bikes in Pakistan which include Honda CD70, CD70 Dream, Honda Pridor, Honda CG125, CG125 Dream, Honda Deluxe, Honda CB150f, Honda CBR 150R, Honda CB250f Honda CB500 X and Honda CBR 500r. Honda CD70 2018 price in Pakistan is Rs. 64,900, which is fairly competitive as compared to other brand 70cc bikes available in Pakistan motorbike industry. Honda 70 is also ranked on top in most selling 70cc bikes in Pakistan. The major service network, warranty claim centers and hassle-free availability of spare parts make this 70cc bike by Honda one of the bestselling bikes every year in Pakistan. The bike features appealing graphics and aggressive design, which is being loved by the consumers across the country. The bike is available in two appealing colors which include black and red. Both the color are appealing and give the bike an outstanding appeal in an extravagant manner. Honda CD70 2018 is powered with 70cc 4-stroke single cylinder engine with an enhanced cooling system. The bike is equipped with advanced hardware components, which makes this bike give an extravagant fuel economy. The bike has the capability to give a fuel economy of 60-65kmpl in an effortless manner. Honda CD70 comes with an extended warranty of 2 years which surely gives a peace of mind and great value of money to the consumer. The company has manufactured this bike by keeping in mind the needs and wants of the consumer that he wants to see in a 70cc motorbike. Honda 70 features a traditional design language, which is loved by the consumers. The bike is equipped with powerful shocks, stylish indicators, new shape backlight and a beautiful petrol tank with appealing and catchy graphics. 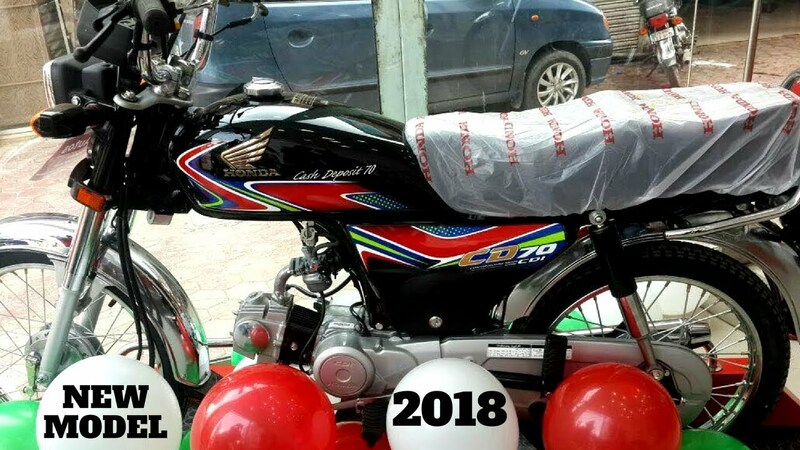 The consumers are also excited that what they will be seeing in Honda CD70 2019, which is also expected to be a high selling Honda bike in Pakistan. This 70cc bike by Honda is highly recommended to the consumers who wish to buy a bike which has an extravagant fuel economy and above all is available at a competitive price tag. 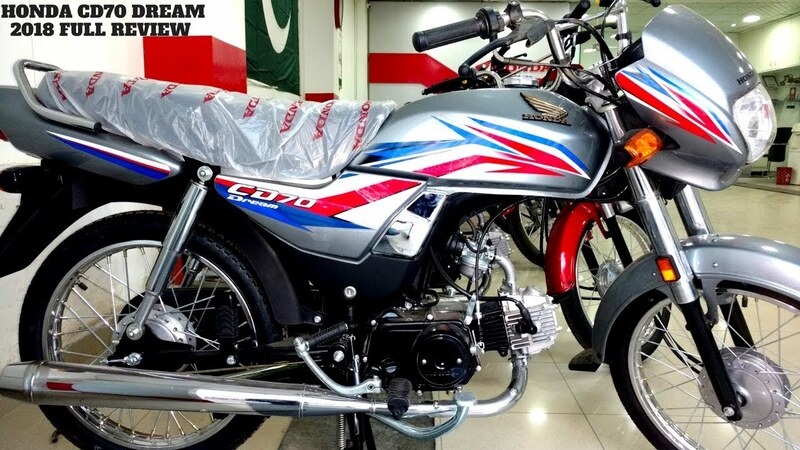 Honda CD70 dream 2018 price in Pakistan is Rs.68,500, which is competitive as compared to other brand bikes with similar engine specs and features. Honda dream is a bike which was a fantasy and now has turned in to reality for the young riders by the company. It is simply not just a bike but is considered as the queen of all 70cc bikes which the consumers come across in the bike industry of Pakistan. Honda CD70 Dream is a bike which features a stylish design, a sporty visor, firm road grip, comfortable seat and a smart speedometer. The bike is given a tagline by the company which is “Chalao Apni Dream”. This 70cc bike is designed in a way which allows it to reduce air resistance and increase speed eventually in an effortless manner. The shocks of the Honda dream are worth commenting as they are tough and works pretty well on uneven and bumpy roads. CD70 dream is known for its appealing design and comfortable ride experience which it gives to its rider in an extravagant manner. The bike is powered with the 4-stroke single cylinder air cooled 72cc engine with 4-speed transmission. Atlas Honda is known for producing high-performance bikes and Honda CD70 Dream is known for it. 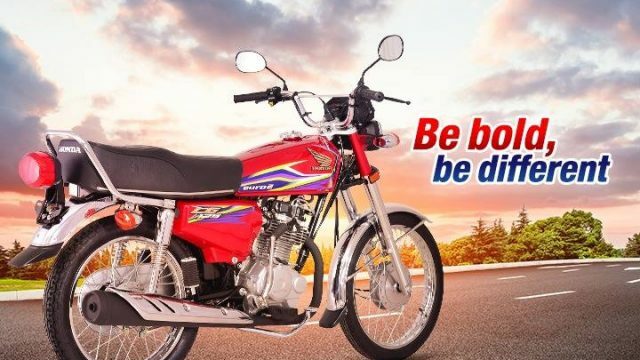 To achieve the top rank on all other brand 70cc bikes in Pakistan, Honda dream comes with a sleek and stylish design language which is not seen in other brand 70cc bikes. The design of the bike is an innovative mixture of a normal bike and a sports bike, which is the main reason for its attraction of customers towards it. The bike is available in two appealing colors which are Black and Red. The upcoming Honda CD70 Dream 2019 is also expected to be designed in an extravagant manner, which will surely be loved by the young riders across the country. Atlas Honda Pakistan has made an extravagant appearance in the 100cc motorbike industry by introducing Honda Pridor 2018. The bike is fully loaded with innovative features and specs. Honda Pridor 2018 price in Pakistan is Rs.89,900, which is reasonable as compared to other brand 100cc bikes available in Pakistan. 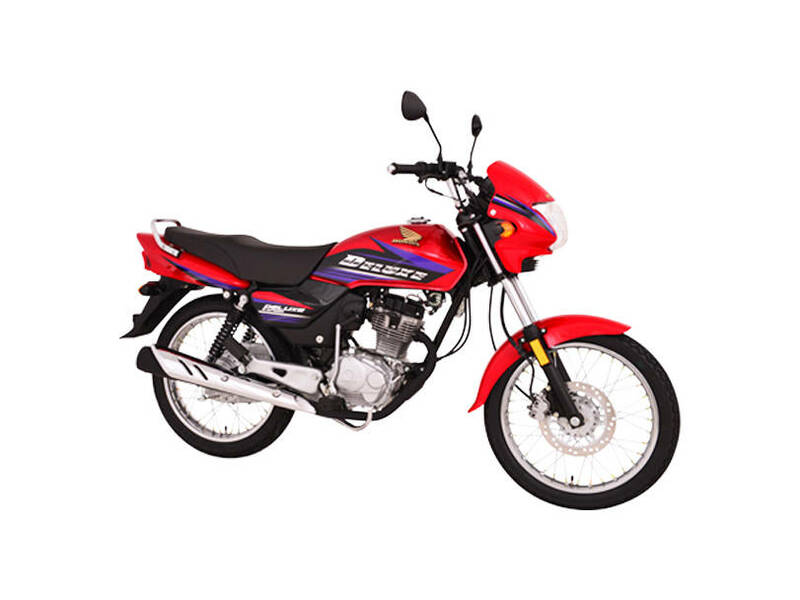 The label of Atlas Honda on this Honda 100cc bike automatically generates a high level of confidence in the mind of buyers as they are fully aware that they will not be disappointed by the bike quality and design. Honda 100 Pridor is a successor of Honda CD100 which was previously launched in the market for its valued customers. Honda 100 Pridor features an aerodynamic design with extravagant fuel economy. The bike is equipped with 100cc 4-stroke OHV engine. The bike features a glossy masked headlight, wrapped silencer with the slice of silver, bright indicators and appealing graphics on the fuel tank and side covers. When we talk about 100cc Honda Pridor, you will be glad to know that it features a durable build quality, which makes it impressive for its riders. Durability is not only everything in Honda 100cc bike but this bike also has a tremendous engine power which allows it to compete with its rivals on road. This bike surely makes the rider feel pride while driving. 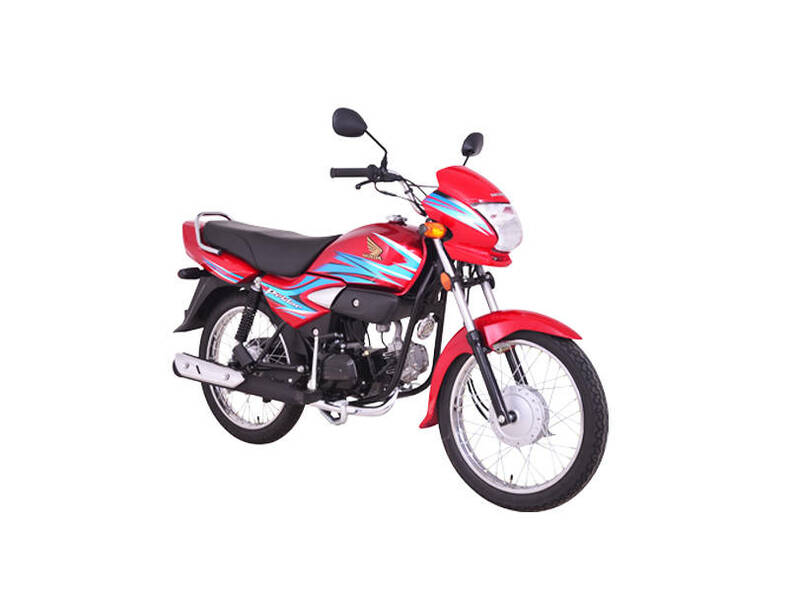 Honda CG125 2018 price in Pakistan is Rs.109,900, which is economical as compared to other brand 125cc bikes available in the motorbike industry with similar features and specs. CG125 Honda is a bike which has been a style icon for several years. This bike is an icon of true power, style, and perfection. Atlas Honda has designed this bike to roadmaster all kinds of roads and give its rider a true pleasure of a comfortable ride. This bike never lets its user down when they talk about its fuel economy and comfort. 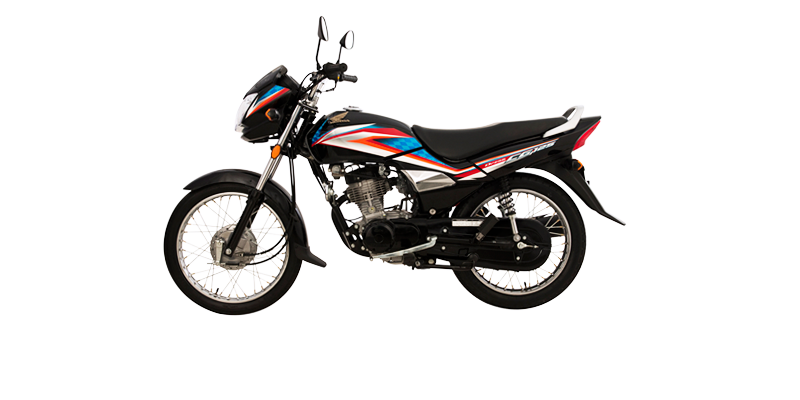 Honda cg125 is a bike which is considered among one of the most powerful 125cc bikes in Pakistan. This bike is in high demand among the young riders, as they want to drive a bike which gives them extreme pleasure and comfort at high speeds. Honda CG125 is powered with 4-stroke single cylinder EURO II technology 125cc engine, which has the capability to give an extravagant fuel economy. The bike features a 12-liter fuel tank, powerful shocks, appealing graphics on the fuel tank and side covers. CG125 Honda is a stunning invention of the latest Japanese technology which makes it survive and run smoothly in all conditions. The new design silencer gives the bike an overall aggressive appeal. Moreover, the reason behind the popularity of this 125cc bike by Atlas Honda Pakistan is its resale value and aggressive design. Honda CG125 Dream 2018 price in Pakistan is Rs.106,900 that is also reasonable when we compare it with other brand 125cc bikes. Atlas Honda after the great success of its most selling Honda CD70 dream has introduced this new 125cc sprinter in the dream family. CG125 dream features a smart, sporty and trendy design language, which is being loved by the young riders in the country. This bike can surely be said an economical variant of its big brother CG 125, which is already in high demand due to its innovative features and specs. The bike comes with modish graphics, comfortable seat and innovative dashboard design with handle lock in the ignition switch. This bike is surely a true value for money, as it has the capability to produce remarkable results in an effortless manner. Honda CG125 Dream is powered with a 4-stroke single cylinder air cooled 125cc engine, which has the capability to give a fuel economy of 30-35kmpl, which is quite impressive as compared to other brand 125cc bikes in Pakistan. The bike comes with the 12-liter fuel tank with 2-liter reserve capacity. Honda 125 dream surely is a bike which will make every dream of the rider true. Honda Deluxe 125 2018 price in Pakistan is Rs.129,500. Honda 125 deluxe price is considered among one of the main reasons behind the popularity of this deluxe bike by Atlas Honda in Pakistan. The premium build quality of Honda Deluxe certainly never goes undistinguished on the road. It certainly is a powerhouse which is powered with 4-stroke single cylinder air cooled EURO II technology 125cc engine. The EURO II technology allows this bike to give an impressive fuel economy. The bike features an aggressive and stylish design language, which makes it a must buy 125cc bike in Pakistan. Moreover, Honda deluxe 125 also has an impressive resale value which most other brand 125cc bikes don’t have due to their ordinary repute among the consumers. Honda Deluxe 125 features hydraulic brakes, appealing graphics on the fuel tank and side covers, powerful shocks, comfortable leather seat and firm road grip. It also comes with tachometer with fuel gauge, which is mostly not seen in any other motorbike brand 125cc bike in Pakistan. Efficient fuel economy has always been the main priority of Atlas Honda Pakistan, which is the reason why the 125cc deluxe model also has an extravagant fuel economy. The bike is available in two appealing colors which are Red and Black. Honda CB150 f price in Pakistan is Rs.167,000 which is quite reasonable as being a 150cc bike by Atlas Honda Pakistan. The company is certainly dominating in the 150cc motorbike industry by the launch of this CB150 f bike in Pakistan. This bike is a true combination of power and style, which is in high demand among young riders, who wish to buy a bike which is appealing in design and most importantly available at a competitive price. 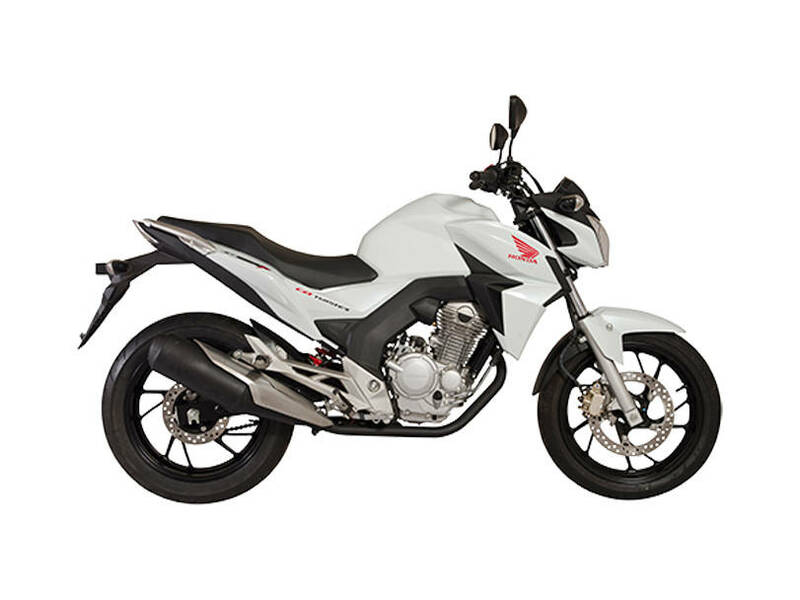 The Atlas Honda CB150f is designed by keeping in account the need and taste of passionate bikers in Pakistan. The bike is powered with a powerful 4 stroke SOHC Inherent Turbo cooled engine with balance 150cc engine, which surely gives true power to this bike. Honda CB150 f is equipped with powerful shocks which allow the rider to enjoy a comfortable ride even on bumpy roads. Its appealing design speedometer comes with fuel indicator and rpm. This bike gives an overall look of a sports bike by any popular brand in the motorbike industry of Pakistan. The salient features of this bike include alloy rims, self-start, sporty design with appealing graphics, powerful shocks, and firm road grip. The one thing that definitely would not be liked by the Honda fans is its low fuel economy. Honda CBR 150r 2018 price in Pakistan is Rs.660,000, which is quite high as compared to other motorcycle brands 150cc sport style bikes. The Honda CBR 150r is considered among one of the best two wheelers bike produced by Honda Japan. Honda CBR features a sporty design like any other high engine sports bike by Atlas Honda. 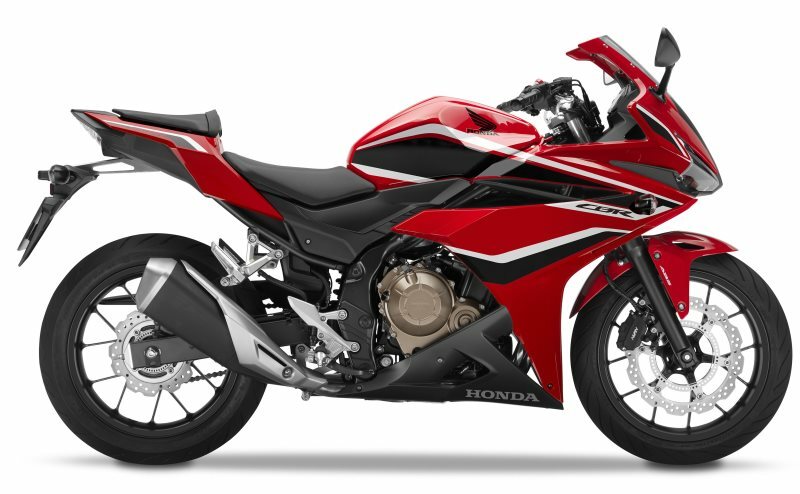 CBR 150 is powered with 4-stroke liquid cooled SI engine which is mated with the 6-speed transmission. It features a fuel injector engine which makes it give an extravagant fuel economy. 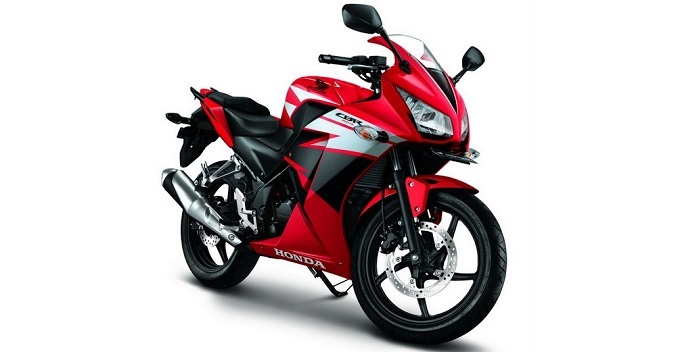 Honda CBR 150 is ranked on top in terms of price in the 150cc bikes industry of Pakistan. Being a high priced 150cc bike it doesn’t disappoint its buyers with its engine performance and build quality. Honda CBR 150 features alloy wheels, stylish speedometer, spring loaded hydraulic type rear mono shocks, sporty fuel tank, and appealing graphics. The powerful shocks of this bike let it perform in an extravagant manner even on bumpy roads. The bike is equipped with front and rear disc brakes which enable the bike to stop at high speeds and come to a stationary position in tight situations. The design of the headlight is innovative, stylish and has the capability to give optimum results. This bike is available three appealing main colors which include White/Black, Red/Black, and Black. Honda CB250 F 2018 price in Pakistan is Rs.6,40,000, which is not reasonable as compared to other brand 250cc bikes available in the motorbike industry. The bike comes with a similar design language like the Honda CB150r. It is powered with 4 strokes single cylinder oil and 250cc air-cooled engine. The bike is overpriced doesn’t mean that it comes with low build quality. 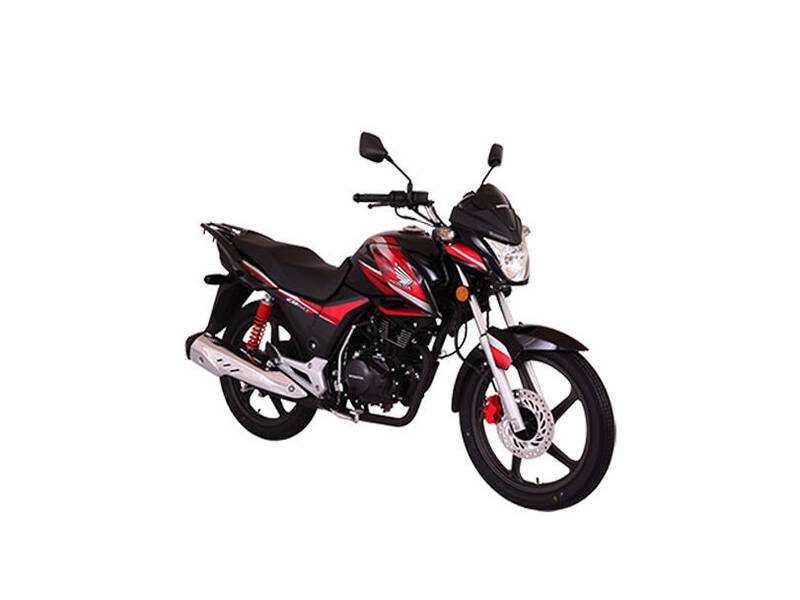 Honda CB250f is certainly not a must buy the bike by Atlas Honda, as it is overpriced in its category and better options are available in this price range. Honda CB500 X price in Pakistan is Rs.12,50,000 which is reasonable as compared to other popular brand sports bikes available in the motorbike industry. CB500 X is certainly the best choice for serious bikers, who are interested in riding a bike that is equipped with a powerful engine and gives an aggressive look overall. In Pakistan, this bike is given to the Dolphin police force for patrolling in the city. This is also the reason why this bike by Atlas Honda is also known as Dolphin Force bike in Pakistan. This bike is equipped with the 500cc twin cylinder liquid cool engine, which allows the rider to enjoy a thrill and buzz during its drive. Honda CB500 X is manufactured in a manner which efficiently fulfills the needs of a modern sports bike racer. The 500cc powerful engine is mated with six-speed gear transmission which generates ultimate storming power. This sports bike by Atlas Honda features powerful shocks, firm road grip, full LCD screen for indicators, speedometer, time display, warning signs, average fuel consumption, and odometer. It sporty seat design allows the rider to enjoy a comfortable ride in an effortless manner. The extravagant features an aggressive design language make this sports bike a must buy for the young racers in the country. Honda CBR 500R price in Pakistan is Rs.12,50,000 which is competitive as compared to other brand 500cc sports bike available in the industry. CBR 500 is a bike which surely is an ideal choice for serious sportbike lovers. No matter if it is a Moto GP event or a street race, Honda CB 500 has the capability to dominate for so many reasons. Honda CBR 500r is equipped with the twin cylinder air cooled 500cc engine which allows the rider to enjoy a high-speed cruise with thrill and buzz. It is a must buy a sports bike by Atlas Honda which has the capability to give a tough competition to other brand sports bike available in the motorbike industry of Pakistan. The powerful 500cc engine is mated with six-speed gear transmission which generates ultimate power in the bike. Honda CBR 500 salient features include powerful shocks, firm road grip, appealing graphics, downforce sports seating design, full LCD screen for indicators, time display, odometer, speedometer and additional information which include a working condition of an engine, warning signs and fuel average. It certainly is a bike which allows the sports bike rider to dominate every race field.